The Year of Music was kicked off with a Proclamation from the Mayor at an event celebrating the launch of both Music Mile and the 2016 High Performance Rodeo in early January. 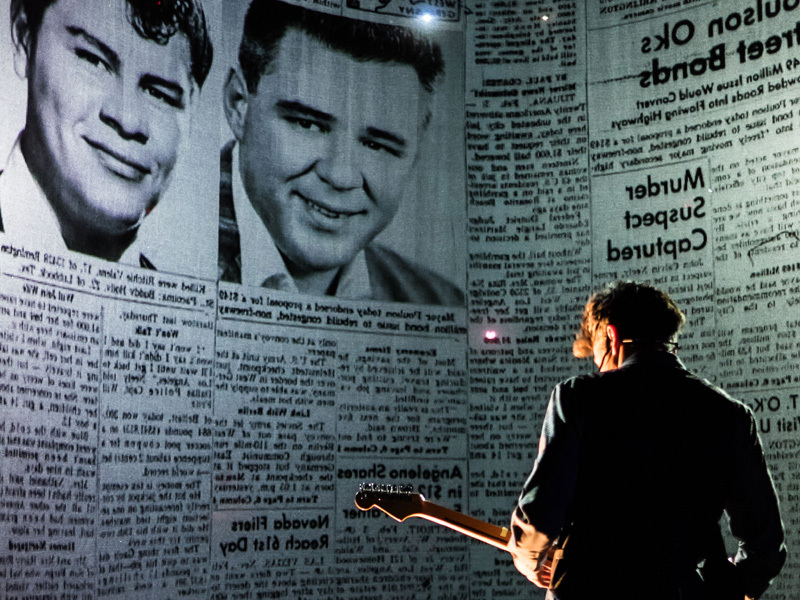 That was the beginning of a year-long celebration of music that included milestones like hosting the 45th Annual JUNO Awards and the opening of the National Music Centre. Calgary hosted one of the most successful JUNOs ever, with more than $9 million in economic activity in one week; 32,000 JUNO event attendees; 225 participating artists; 1,450 local volunteers; and millions of social media impressions and broadcast viewers who heard new stories about Calgary. 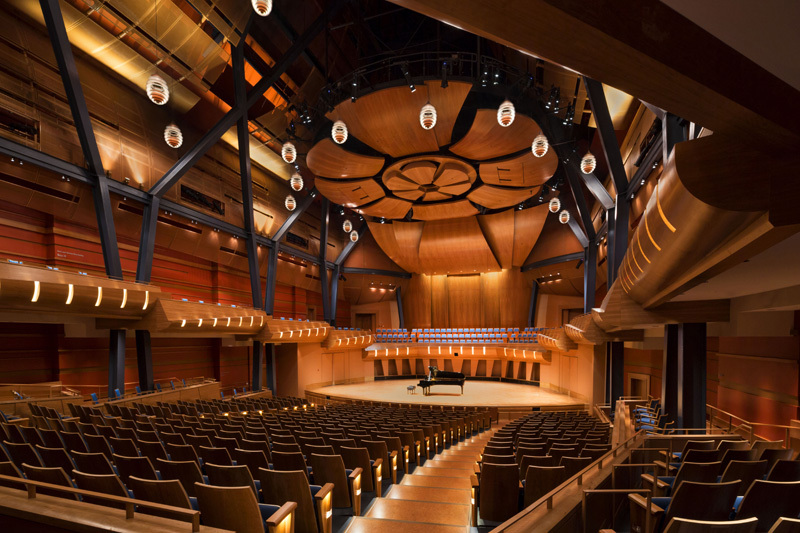 Shortly after the JUNOs, the national spotlight was once again on Calgary with the opening of Studio Bell, Home of the National Music Centre (NMC). 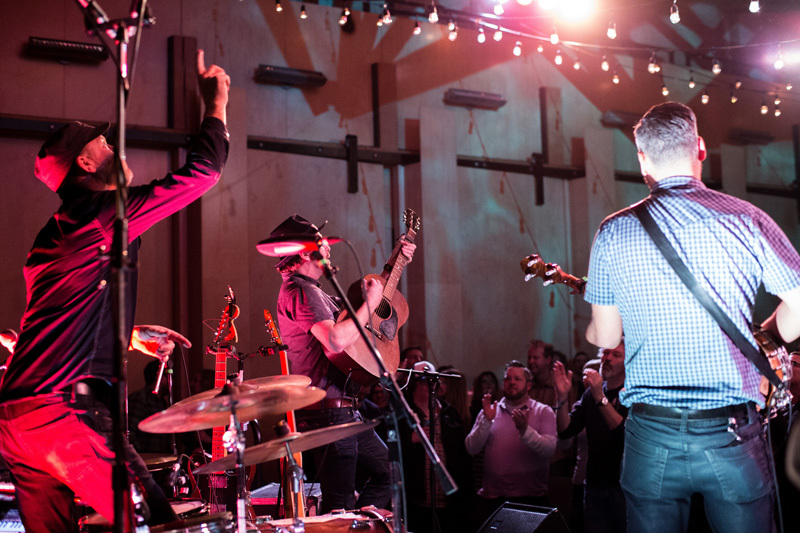 The success of the JUNOs, the opening of the iconic NMC, and the year-long celebration of music reinforced the idea of Calgary as an emerging music city, full of local talent and a demand for musical experiences. 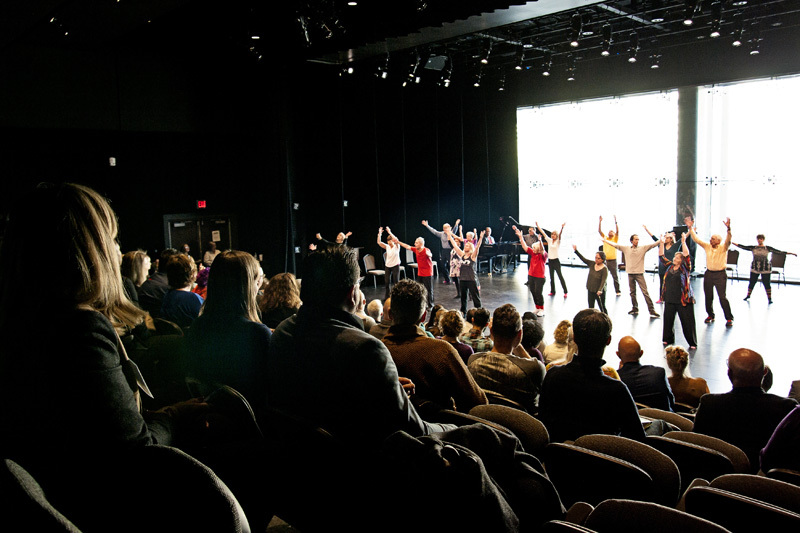 Other significant arts and culture spaces opened their doors in 2016, including the award-winning DJD Dance Centre, the Calgary Film Centre, and cSPACE King Edward. The new Film Centre, in particular, demonstrates a growing focus on the creative industries in our city. 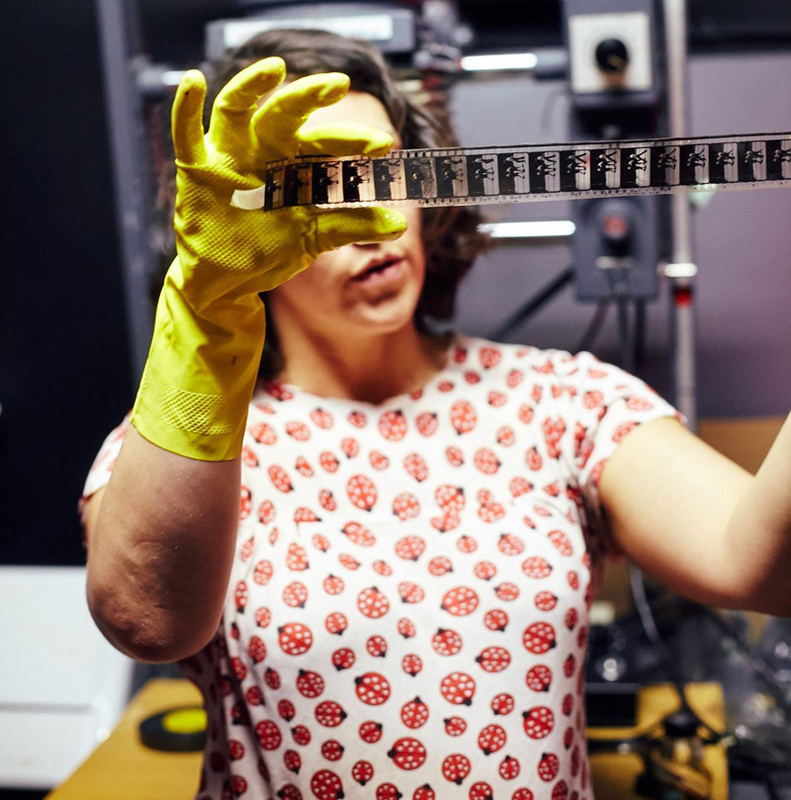 We believe that film (and music, as mentioned above) will play important roles as our partners at Calgary Economic Development continue to explore economic diversification strategies. In 2016, activation of some of the TRC recommendations began. The Calgary Aboriginal Urban Affairs Committee, a citizen advisory committee of Calgary City Council, published the White Goose Flying report–calls to action for our city. 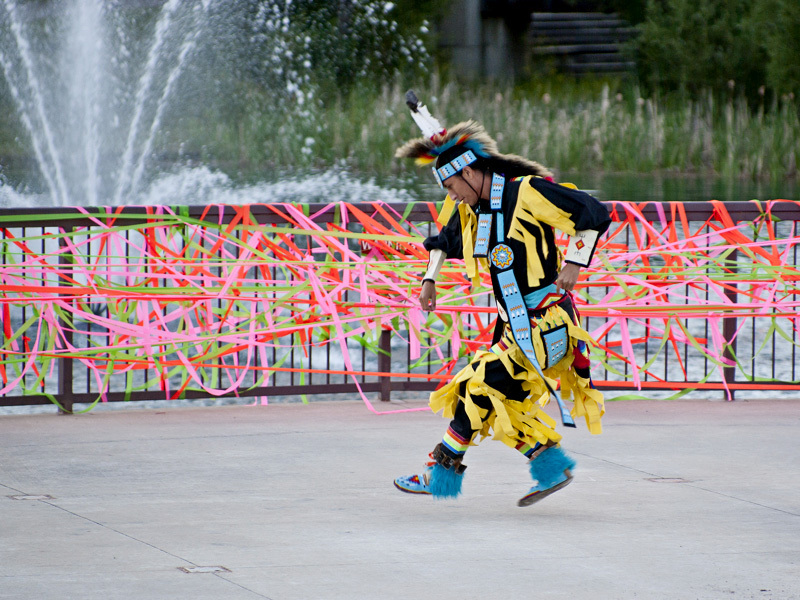 At Calgary Arts Development we undertook our own learning in order to build good relations with Indigenous peoples. It has been no surprise to us that arts and artists offer wonderful ways into this important work. We were grateful to bear witness to multiple REDx Talks events, including the Buffalo Treaty signing in Banff; to attend the Gala performance of Making Treaty 7; to participate in the inaugural Artsdance created by Iiniistsi Treaty Arts Society, and to feature a keynote address about Deep Listening by Brian Calliou at our Creative Calgary Congress. In 2016, we also began serious work in the area of Equity, Diversity and Inclusion (EDI) in the arts. Calgary Arts Development participated in a number of training sessions and other initiatives to increase our own knowledge and capacity, and have adopted EDI as a key value throughout our organization. It is our mission to strengthen the arts sector to benefit all Calgarians, not just some Calgarians. Our EDI commitment provides a way to ensure that more Calgarians are able to exercise their right to live a creative life. 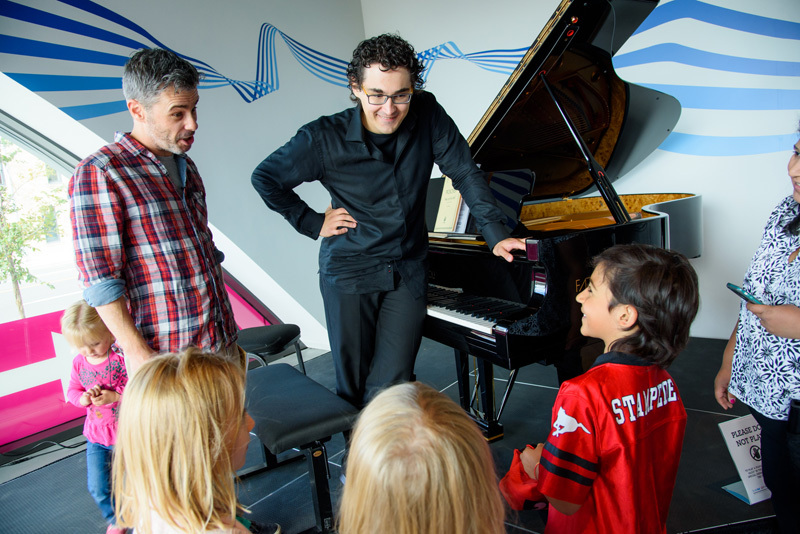 In order to better serve the arts sector, we introduced two new granting programs in 2016: the Organizational Opportunity Grant and the Small Experiments Grant. These programs demonstrate a commitment to streamlining the granting process for smaller organizations and to providing opportunities for organizations to take risks—to try small experiments and gain valuable learning from those experiments. In 2016, The City of Calgary provided a $1 million Arts Emergency Resiliency Fund (ERF), which was administered and distributed through Calgary Arts Development. This fund provided essential relief to organizations experiencing revenue loss and other negative effects of the economic downturn. The ERF helped to ensure that Calgarians could continue to engage with, participate in, create and share the arts, and to live creative lives. 2016 also marked the year that long-time arts champion and public servant, Jeffrey Anderson, retired from his role as Executive Director of the Alberta Foundation for the Arts. Jeffrey was a good friend to Calgary’s arts community, spending his entire career to supporting the arts and creativity in Alberta. We wish him all the best in his next adventure. Now he’ll have more time for his other life as a musician. We believe that all art is powerful and meaningful, and we are thrilled to offer the energy, skills and passion of our team to support the many ways that arts and artists improve lives and contribute to building a great city for all Calgarians. In line with the 2004 Calgary Civic Arts Policy, Calgary Arts Development is responsible for establishing arts investment programs for capital projects, organizations’ annual operations, individual artists and other purposes that strengthen Calgary’s arts sector. Calgary Arts Development invests at least 75% of the dollars received from The City of Calgary directly into the arts sector through grant investment programs, with the remaining 25% being used to strengthen the arts sector through arts development activities and administration. Calgary Arts Development’s approach to investment is broad, including direct monetary support through grant investments as well as fostering long-term resilience through capacity-building in the arts sector. In total, Calgary Arts Development invested $4,749,765 through these programs in 2016, a 4.3% increase over 2015. In addition to regular programs, in 2016 Calgary Arts Development also administered the Emergency Arts Resiliency Fund on behalf of The City of Calgary, which saw an additional $1 million invested into the arts sector. This program invests in professional development for individual professional artists, contributing towards expenses related to a unique artistic or career opportunity to a maximum of $2,500. Although the grants are modest, the impact can be transformational. The Artist Opportunity Grant Program has quarterly intake deadlines for application. Demand far outweighs the amount of investment available. 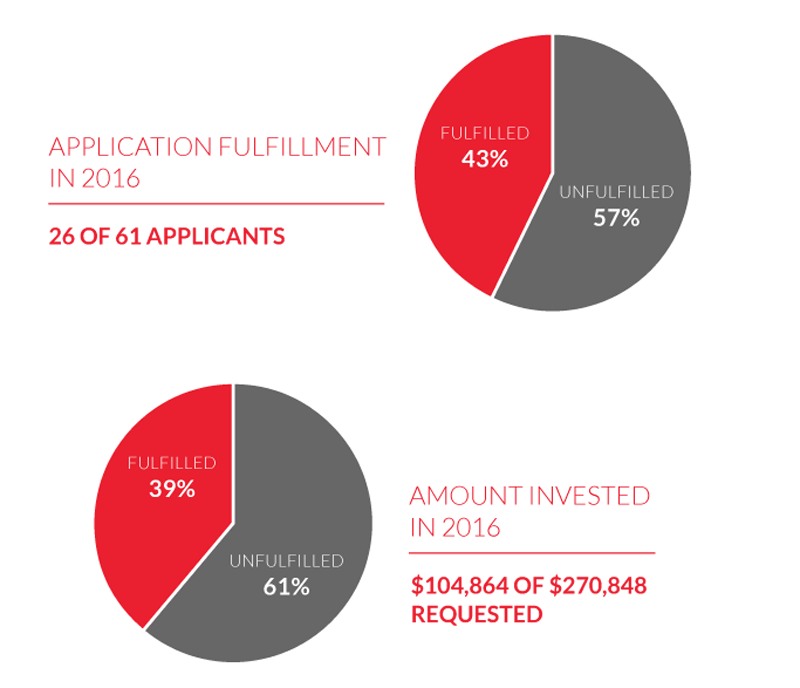 We were able to invest in 42% of qualified applicants in 2016, granting 34% of the total requested funds. New Pathways for the Arts is a three-year program to develop a learning community of up to 20 not-for-profit organizations that undertake artistic work or programs. 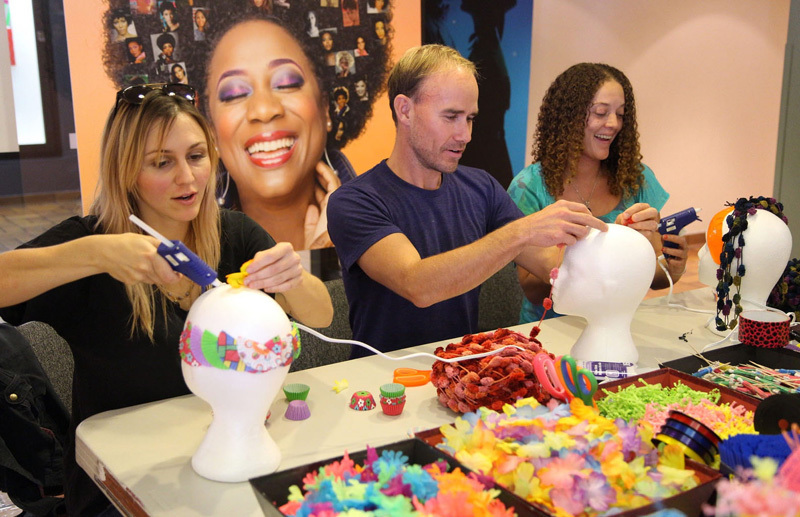 Based on EmcArts’ successful work with not-for-profit arts organizations around the United States, New Pathways is a carefully crafted local response to the specific and urgent needs of arts organizations. The program cost $348,551 to deliver in 2016, with $65,000 funded by partners including the Alberta Foundation for the Arts, Calgary Foundation and the Suncor Energy Foundation. Calgary Arts Development invested $283,551 into the New Pathways program in 2016, including $75,000 in innovation grants directly to arts organizations. 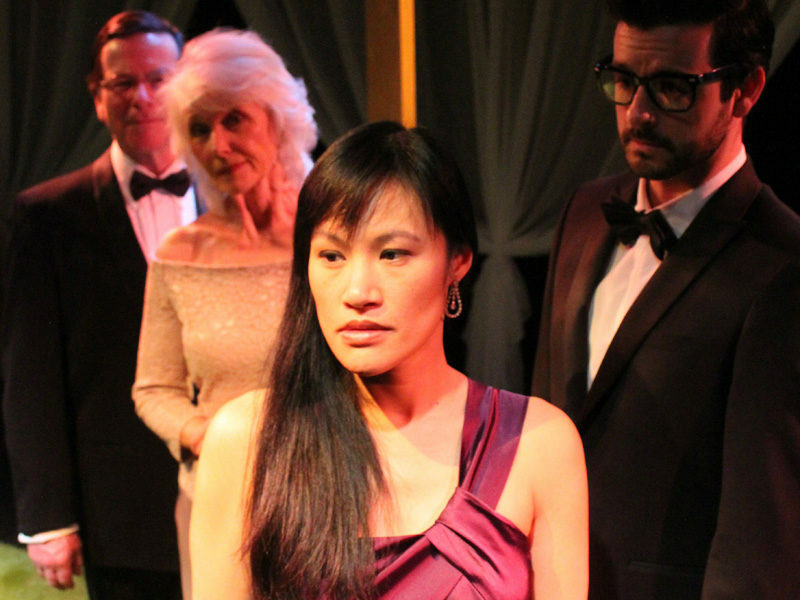 Three organizations moved on to the third phase of New Pathways for the Arts in 2016. Each organization was supported to develop and prototype an innovative approach to a complex challenge and received a $25,000 innovation grant. 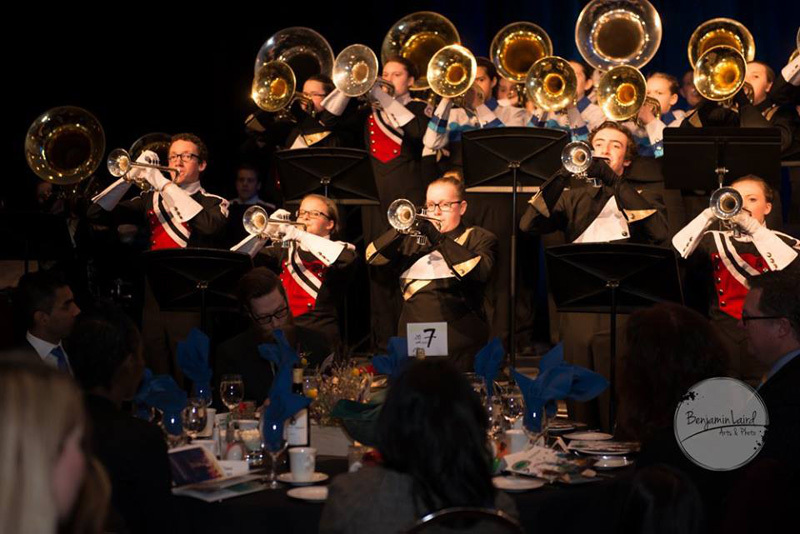 Calgary Arts Development provides operational support to nonprofit organizations with year-round, arts-driven operations through the Cornerstone Program, the Operating Grant Program and the Organizational Opportunity Grant Program. 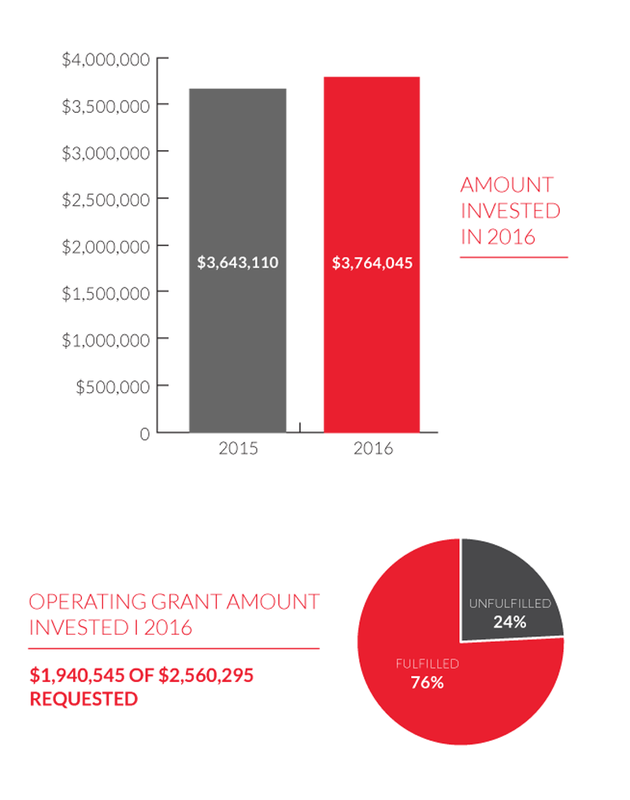 Operational funding is the single largest investment made by Calgary Arts Development each year. These investments support organizations that demonstrate high artistic impact, public impact and organizational resiliency. Organizations may allocate these funds to any areas of their overall budgets. In 2016, Calgary Arts Development invested $3,764,045 (compared to $3,643,110 in 2015) in 164 organizations (154 in 2015). The organizations listed below produced or presented a total of 9,223 public activities for a total audience of 2,965,393. Demand for operating funds continues to outweigh the funding pools available in these programs. In the Operating Grant program, we were able to fund only 76% of the total investment requested. The Organization Opportunity Grant Program is a new grant investment program that was introduced in 2016. The goal of this program is to provide support for Calgary arts organizations that are poised to enhance their contribution to the city. Some organizations decided to apply to this new program in 2016 instead of applying to the Operating Grant Program. 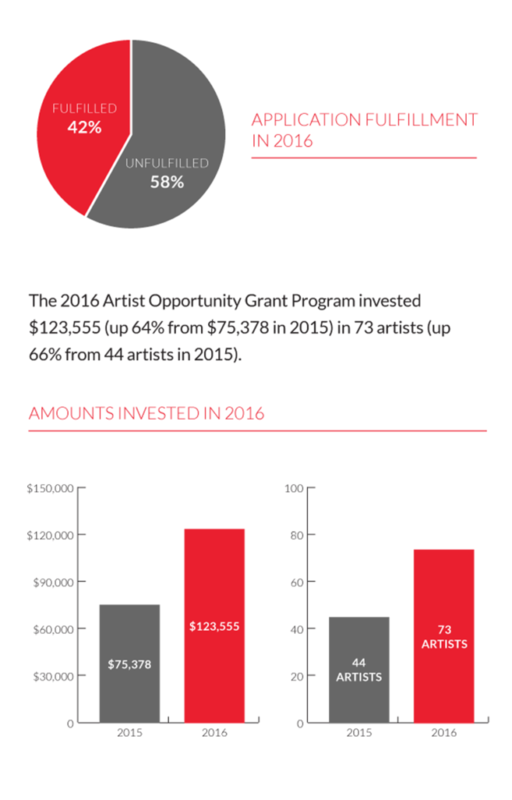 In 2016, Calgary Arts Development invested in 33 organizations through this program (representing 72% of the 46 who applied) with a total investment of $118,500 (17% of the $709,312 in requests that were received). This unique investment program is delivered in partnership with the Calgary Hotel Association. In 2015, the Calgary Hotel Association renewed a three-year commitment to the program and increased the investment to $1,200,000 over the three years. The program develops customized, multi-year investment strategies with arts organizations who present a compelling vision for remarkable experiences that benefit Calgarians and visitors alike. 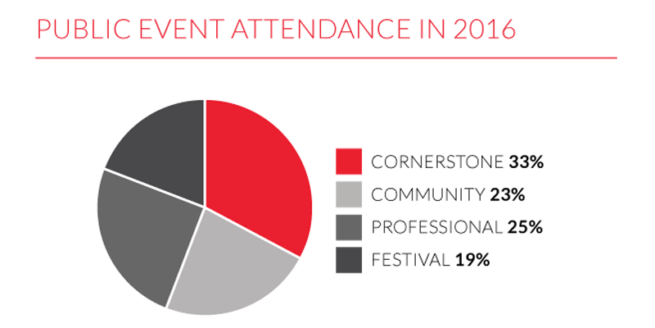 Through the first year’s investment, these organizations boosted Calgary’s reputation as a cultural hotspot, engaging 229,000 attendees, with just under 8% of that audience from out of town. Their activities generated over 1,500 room nights. The Calgary Hotel Association’s $1.2 million Destination Marketing Fund investment over three years allows organizations in the REA program to take the risks they need to grow into sustainable, regional, national and international draws for Calgary, while at the same time improving the experiences that contribute to Calgary’s brand as a cultural tourism destination. In addition to DMF investment, the REA provides development advice based on each organization’s needs and multi-year strategic plan. During 2015-2017 the REA program is also providing support to develop and implement tourism marketing strategies for three of the participating organizations. 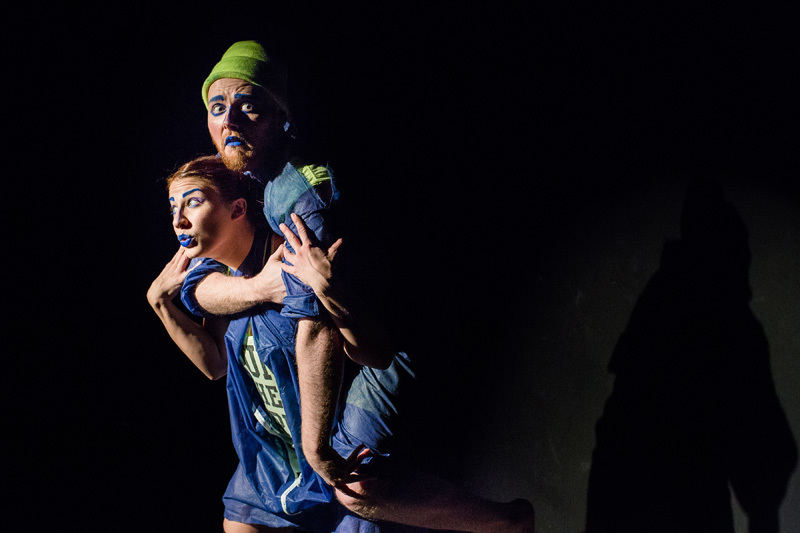 Calgary Arts Development categorizes grant investees into four categories. 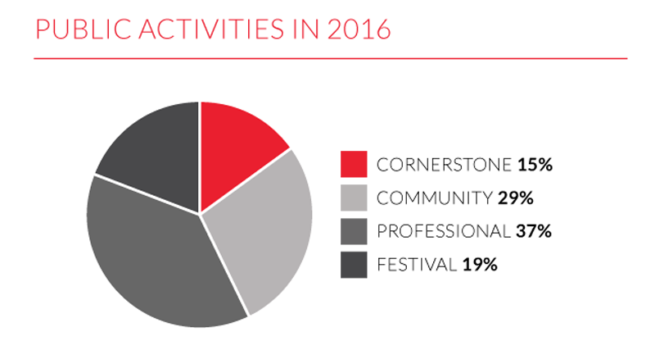 There are 10 Cornerstone Companies, 70 Professional Companies, 66 Community Organizations, and 13 Festivals. The following charts demonstrate some of the differences between the four categories. 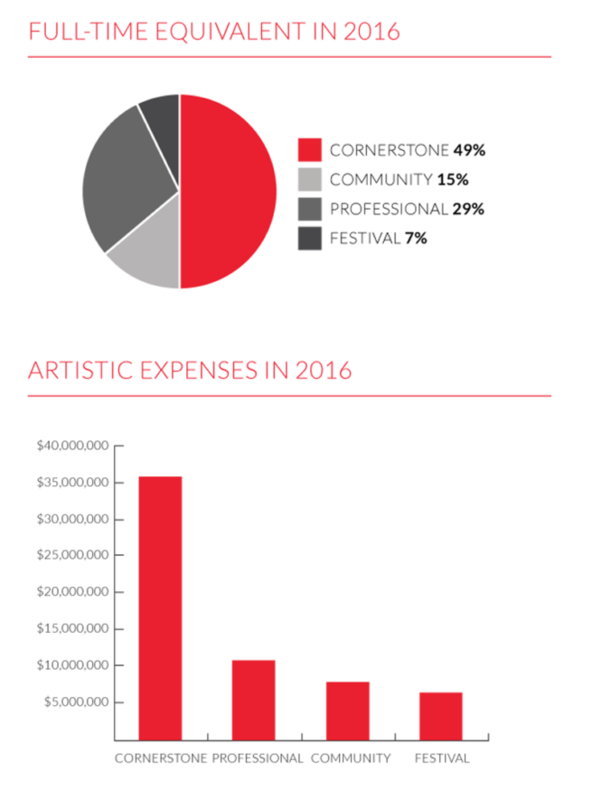 The Cornerstones are an integral part of the overall arts ecosystem and receive 46% of Calgary Arts Development’s Operating Grant investments. 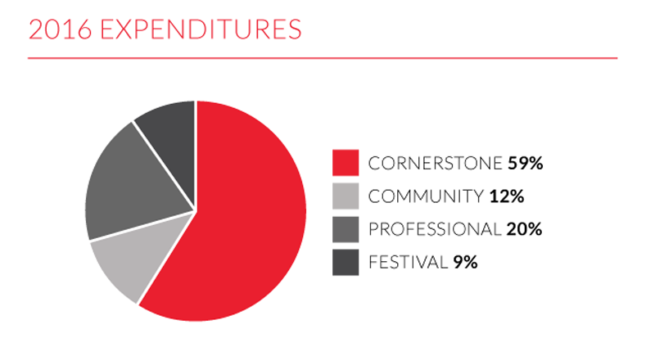 The Cornerstones account for the majority of artistic spending amongst our 150+ grant investees. 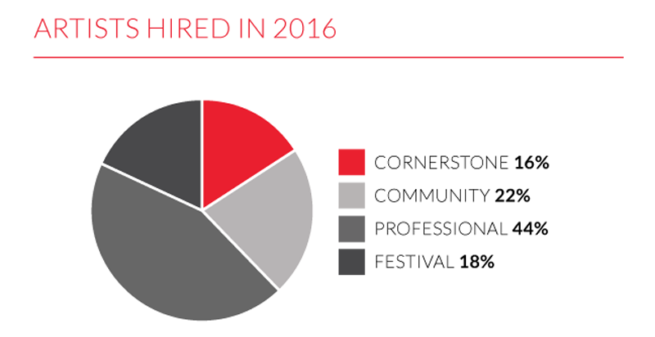 Cornerstone Companies have the majority of the hiring power within the pool of not-for-profit organizations funded by Calgary Arts Development when it comes to full-time administrative and artistic staff. They also have the greatest overall expenditures including artistic expenses. Organizations in the Professional category hire the greatest number of artists and present the largest number of public activities of all the categories. 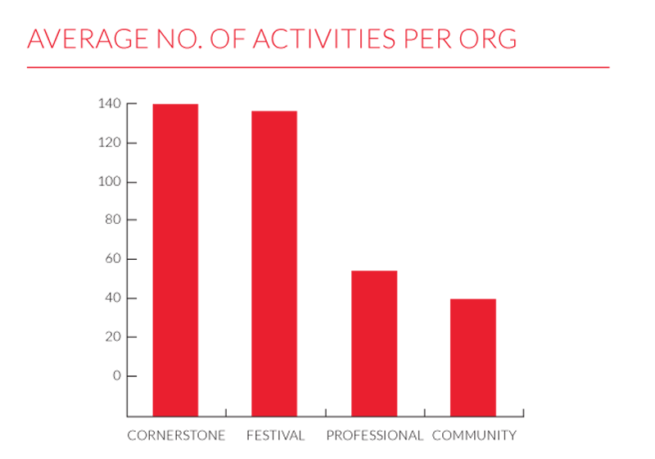 The 10 Cornerstone Companies collectively account for the least number of public activities provided in 2016, however when compared against the number of organizations in each stream, the Cornerstones individually present on average more activities than any other stream, followed closely by Festival organizations. Professional organizations offer the greatest number of education activities, with some companies entirely focused on youth and education. Community organizations engage the most volunteers for the greatest number of yours, double the amount of any other category. Cornerstones are generally large companies that present full seasons of work. 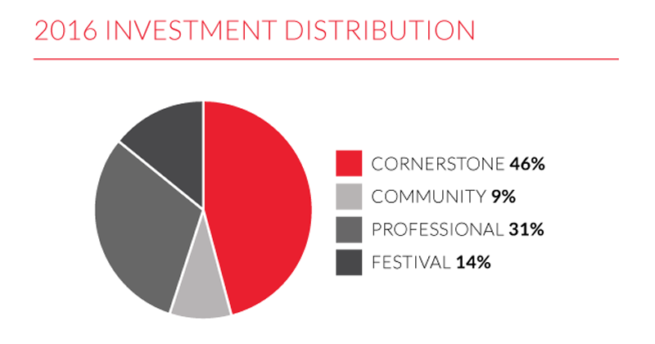 The 10 Cornerstone Companies account for 33% of the overall audience. Festivals are more likely to be large-scale events that take place over a concentrated period of time. Festivals are instrumental in attracting broad-based audiences, often families, and are great for bringing visitors to our city. The 13 Festival organizations create a great sense of event and occasion and attract 19% of the overall audience. Community and Professional organizations are deeply embedded in our community and make up the other 48% of the audience base. 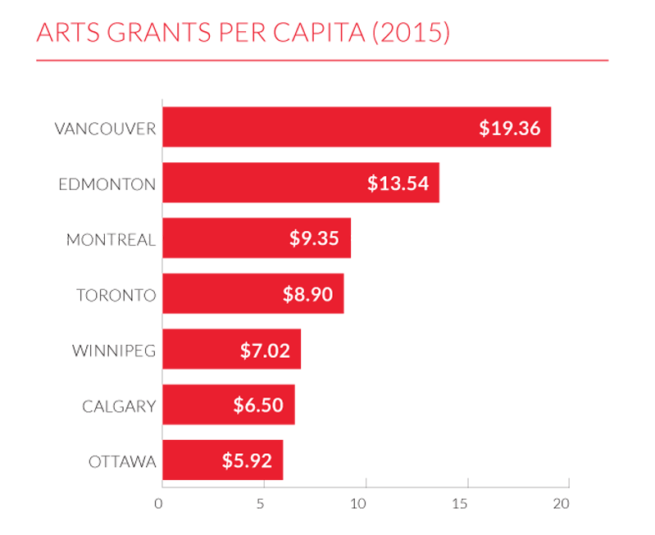 National research that was undertaken by Calgary Arts Development in 2016, shows that Calgary sits second to last in arts grants per capita based on funding to Civic Arts Councils, in addition to any direct funding from The City to an arts organization. The Municipal Benchmarking Network Canada (MBNC) enables participating cities to record measures across 64 service areas, so that they can then track, share and compare performance data and operational practices. The following four cities from this chart take part in MBNC: Calgary, Montreal, Toronto, and Ottawa. The City of Vancouver does not have an arts council and therefore this calculation is based on their Culture Grants total stated in the 2015 Cultural Services Administrative Report (March 17, 2015), and Cultural Infrastructure Grant Program and Grants for Emerging Artists. Vancouver has other non-grant programs which are not included in this number: Artists in Community Program, Artists Live-Work Studio Awards Program, and Neighbourhood Matching Fund. The City of Edmonton’s per capita is based on amounts granted through the Edmonton Arts Council in their General Fund, Program Fund and Community Investment Grants. The allocated amount for Public Art has not been included in this figure. The City of Winnipeg does much of its arts granting through the Winnipeg Arts Council. However, the City of Winnipeg also grants to 17 arts organizations directly ($708,694) which has been added to the Winnipeg Arts Council’s revenue for this calculation. Similar to Edmonton, the amounts for Public Art have not been included for Winnipeg. The data presented above includes arts grants only. The City of Calgary supports the arts in many other ways including having made a significant investment in capital projects over the past 10 years, resulting in an increase in the number of arts spaces available to artists and citizens. The goal of this program, introduced in 2016, is to provide support for Calgary artists, collectives and arts organizations looking to develop new approaches to challenges and opportunities relevant to the work they do in the arts. The Small Experiment Grant Program invests in low-risk, highlearning experiments addressing a clearly identified issue, a hypothesis being tested, and a method for collecting information and learning from results. The program was open to professional artists or collectives, arts-based community groups, and non-profit arts organizations registered as a society in the province of Alberta. The program offered a maximum of $5,000 to cover any expenses related to a single experiment. The total amount of funding available through this program was $105,000. In 2016, 26 experiments were funded (representing 43% of the 61 applications received) with $104,864 invested (39% of the $270,848 in requests). 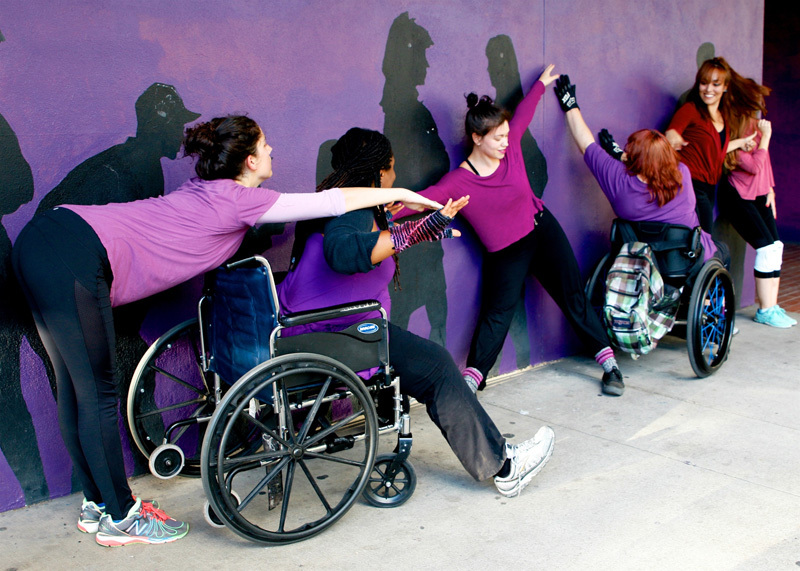 The ArtShare Program developed from our experience with the Arts for All Program. Arts for All began in 2013 as a way to strategically invest in arts activity outside the downtown core, focused on East Calgary during the pilot period. The goal of ArtShare is to invest in artists, arts organizations and arts initiatives that contribute to a diverse and inclusive arts community on behalf of all the citizens of Calgary. In 2016 the program made two investments; $30,000 in operational support to Making Treaty 7 Cultural Society and $12,500 to support our In/Pact partnership with the Calgary Congress for Equity and Diversity in the Arts. Through a $1,000,000 partnership with The City of Calgary in 2016, this program allocated investments to arts organizations that were affected by decreased revenues, such as earned and corporate support, and increased demand on programs as a result of the economic downturn. These funds were provided in order to ensure that Calgarians continued to enjoy the benefits of, and have access to, a strong local arts scene. The goal of this program was to provide one-time support for Calgary arts organizations that have been impacted by the economic downturn and global events. 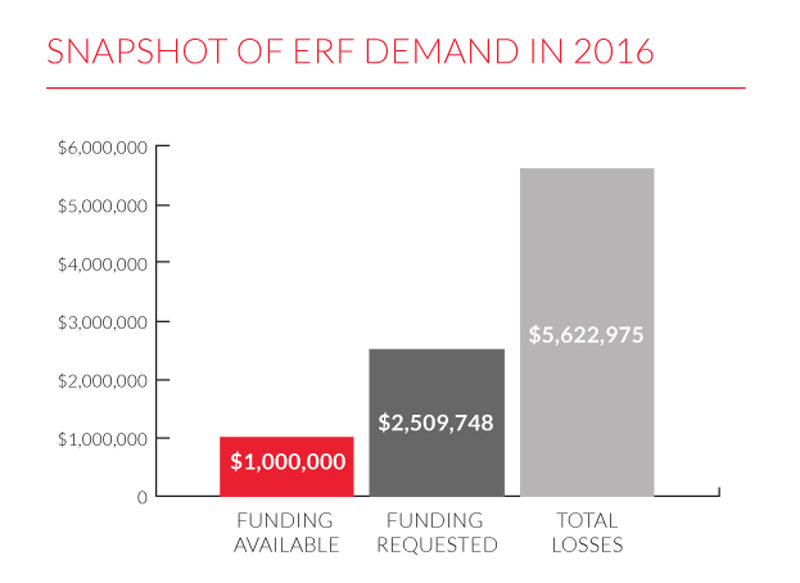 In 2016, the Calgary Arts Emergency Resiliency Fund (ERF) provided a total of $1 million to 34 organizations. During this period, 47 organizations applied for a total of $2,509,748 in eligible requests. Organizations who applied to the fund only requested a portion of their estimated losses of $5,622,975. Calgarians engage with the arts in many ways—by creating, participating, attending and sharing. Calgary Arts Development hosts and leads a variety of programs and initiatives that investigate, develop, promote and celebrate arts engagement in our city. Key to achieving our mission of supporting and strengthening the arts to benefit all Calgarians is an understanding of how the community perceives and engages with the arts. 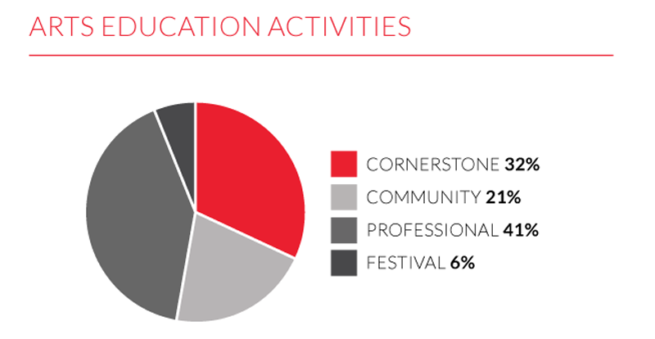 In the fall of 2016, we contracted Stone-Olafson to conduct an Arts Engagement Research Study to monitor overall awareness and familiarity of various festivals and events, gauge interest of Calgarians in attending these events, understand arts engagement in Calgary, and examine Calgarians’ attitudes toward the arts and its impact on communities. This was a follow-up to a 2014 Arts Engagement Research Study, also conducted by Stone-Olafson. 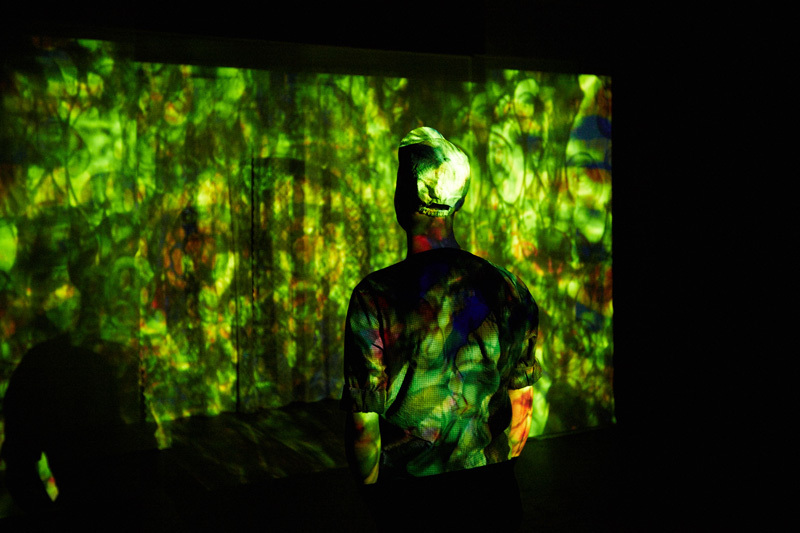 Technology has enabled recent increases in arts engagement, especially among younger Calgarians. Arts engagement appears tied, in some measure, to length of time in Calgary. Engagement grows to its highest levels among the newest Calgarians. The arts community appears to be a gateway for community involvement among the most recent residents. Live arts attendance appears to be alive and well in Calgary. 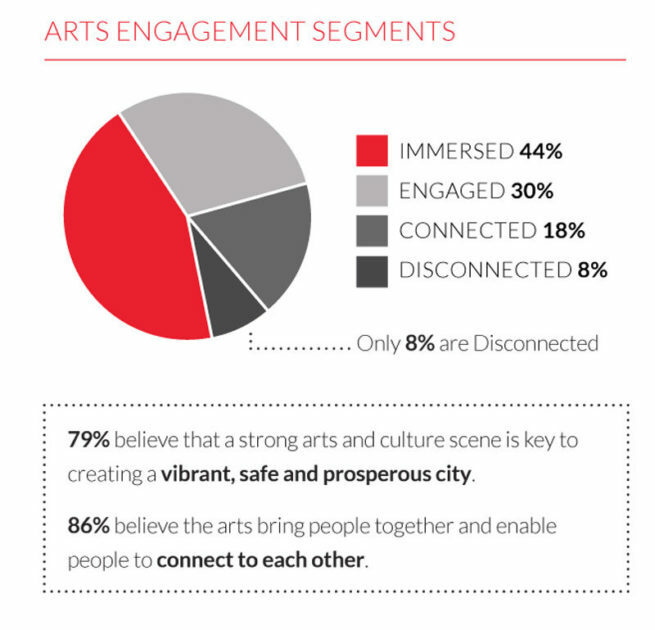 Engagement with the arts remains very strong with the vast majority (92%) connecting with the arts in one way or another—this is up slightly from 2014 when 87% were seen to be engaged. Audiences engage with the arts in three ways: through media, through creation, or through attendance. Immersed Audiences engage with the arts in all three ways. Engaged Audiences engage with the arts in two different ways. Connected Audiences engage with the arts only in one way. Disconnected Audiences do not engage with the arts. The shift seems driven by digital and economic trends having an impact on how Calgarians engage with the arts. The increase in overall engagement is due mostly to an increase in arts consumption through the media. With the ongoing growth of media technology and increased availability of content this trend should not be overly surprising. 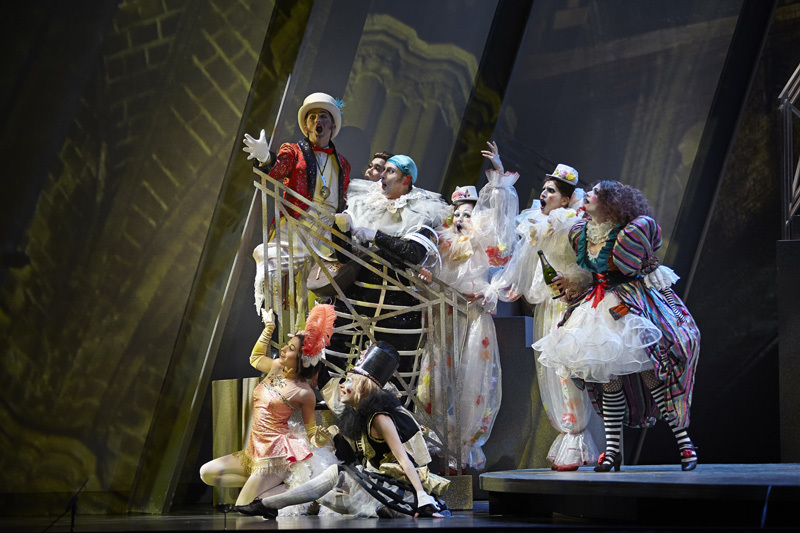 New media engagement allows audiences to customize and personalize the arts they consume. (Personalization and customization are widespread consumer trends impacting many retail sectors.) At the same time, the proportion of those only attending or creating has dipped. It would appear that engagement with the arts right now is becoming more intense—more people doing more things, and given the increase in media, slightly more personal. Since its launch in 2014, Living a Creative Life: An Arts Strategy for Calgary has gained momentum, both as a strategy and also as a way of life in Calgary. There are more than 120 signatories to the strategy and more organizations adopting the vision of Living a Creative Life in their own strategies and plans. In 2016, Calgary Arts Development launched The Storytelling Project—a weekly story, written by arts writer Stephen Hunt, featuring a Calgarian who is living a creative life. The stories are shared through social media, our newsletter, and hosted on our website. In 2015, a group of visionary community members met regularly as an Advisory to Calgary Arts Development to help increase the impact of the arts strategy and to activate engagement with individual Calgarians. 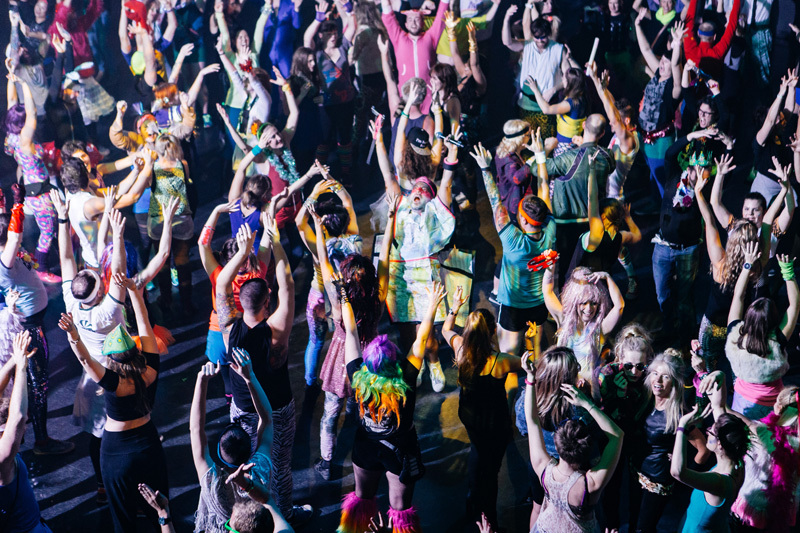 The work of this committee continued through 2016, culminating in the Creative Calgary Congress, which took place in November, 2016 at the DJD Dance Centre and Hotel Arts. The Creative Calgary Congress was designed as a way of sharing ideas and knowledge, and to find new and renewed ways of working together with other city-building agencies and community-minded people. Its goal was to unleash the special power of the arts and creativity to ensure Calgary becomes an even more curious, compassionate and creative city for all Calgarians. It was a sold-out event with more than 160 people in attendance. The Creative Calgary Congress came at an important time, when world events seem to indicate that there are more things dividing people than uniting them. At the event, we explored ways that artists and the arts can be in service to building a more connected, prosperous city for all citizens. The Calgary Poet Laureate is an artistic ambassador for Calgary, presenting at civic events and producing literary work that reflects our city and its citizens. 2016 marked the transition of Calgary’s second Poet Laureate derek beaulieu to Micheline Maylor as Calgary’s third Poet Laureate. In 2016, beaulieu participated in 15 events adding to the over 80 events he had participated in as Poet Laureate over his two-year term. As part of derek’s legacy project he produced WHERE NEXT, a creative writing, narrative, film and contemporary art symposium designed to spark conversation across art disciplines in Calgary. After being appointed Calgary’s third Poet Laureate, Micheline Maylor participated in 58 public events in 2016. Highlights included her work with the anti-poverty coalition and her attendance at the Governor General Awards. The Calgary Poet Laureate program awards each Poet Laureate an annual honorarium of $10,000, funded by a group of Calgary Poet Laureate Ambassadors. 2016 Ambassadors included the Calgary Foundation, the Calgary Chamber, and First Calgary Financial. The sold-out event was held on March 16, 2016 at the BMO Centre, with more than 650 attendees. Programming included a video presentation of the 2016 Cultural Leaders Legacy Artist Award recipients, the TELUS Youth Arts Showcase, a Q&A with attendees about the ways in which people can champion the arts in our community, and comments from emcee Dave Kelly as well as His Worship Mayor Naheed Nenshi. Proceeds from the 2016 Mayor’s Lunch for Arts Champions contributed resources back into the arts sector through our grant investment programs. The event raised approximately $20,000 in 2016. The Cultural Leaders Legacy Artist Awards offered each of seven recipients a $5,000 cash prize, totalling $35,000 to Calgary artists and arts organizations in 2016. Clem Martini is a healer, well-known as a playwright and author who tackles the dark subject matter of mental illness, trauma and marginalization with wit and compassion. Tayebe Joodaki is a visual artist who moved to Calgary from Iran in 2015. She is excited to share her chalk pastel technique with her new home of Calgary. Swallow-a-Bicycle (Colin Jackson and Arlene Strom Creative Placemaking Award) Under the direction of founders Mark Hopkins and Charles Netto, Swallow-a-Bicycle has recontextualized the way Calgarians engage in art by creating theatre experiences in non-theatre places since 2006. 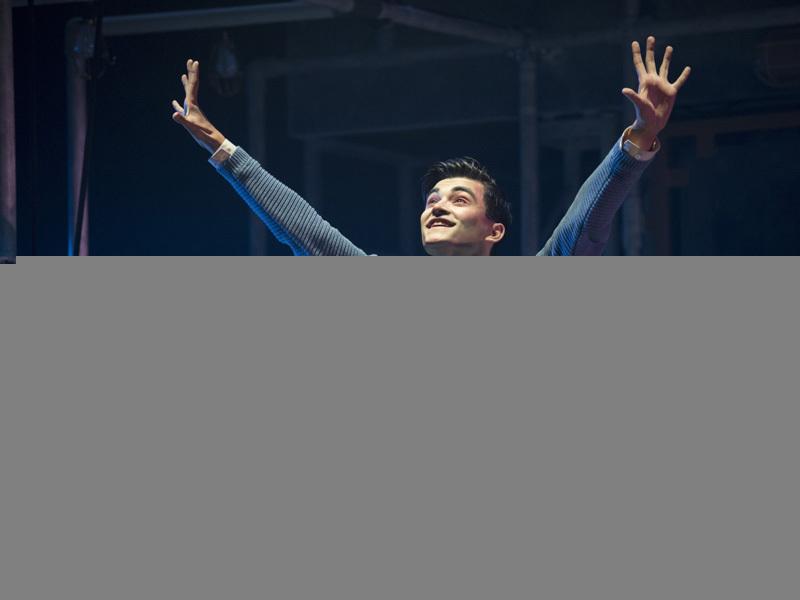 A technician and stage manager, Anton is becoming more recognized for his work as an emerging designer. His success is the result of years of committed practice, and an ongoing relationship with Calgary’s arts and innovation community. Cofounder, current Founder in Residence and long-time former Artistic Director of Decidedly Jazz Danceworks, Vicki has been a major force in the Calgary dance community for nearly 50 years. Through its ongoing work with marginalized groups, decades of innovative youth outreach, and the cultivation of a welcoming, inclusive community, Quickdraw has proven its commitment to enriching Calgary’s cultural landscape. The Old Trout Puppet Workshop is a true Calgary institution: wildly creative and totally original, there’s nothing else like them in this city, in the country and even worldwide. A special thank you to Banff Centre for Arts and Creativity for the Artist Residency granted to this year’s Outstanding Calgary Artist Award recipient. Access to affordable and suitable space is essential for a healthy arts community. Arts spaces are needed for every link in the value chain from creation space, rehearsal space, production space, warehouse and storage space and office space through to presentation and performance space. This arts spaces ecosystem supports all disciplines in the sector, including dance, film, literary arts, music, new media, theatre, and visual arts. It supports community arts, professional arts and education in the arts. Calgary Arts Development runs a variety of initiatives that support artists’ and arts organizations’ access to space. SpaceFinder Alberta was officially launched during Culture Days in 2016. SpaceFinder Alberta is part of a national initiative with six platforms being developed in Canada with support from Canadian Heritage. This online marketplace links organizations that have space to rent with those who need space. 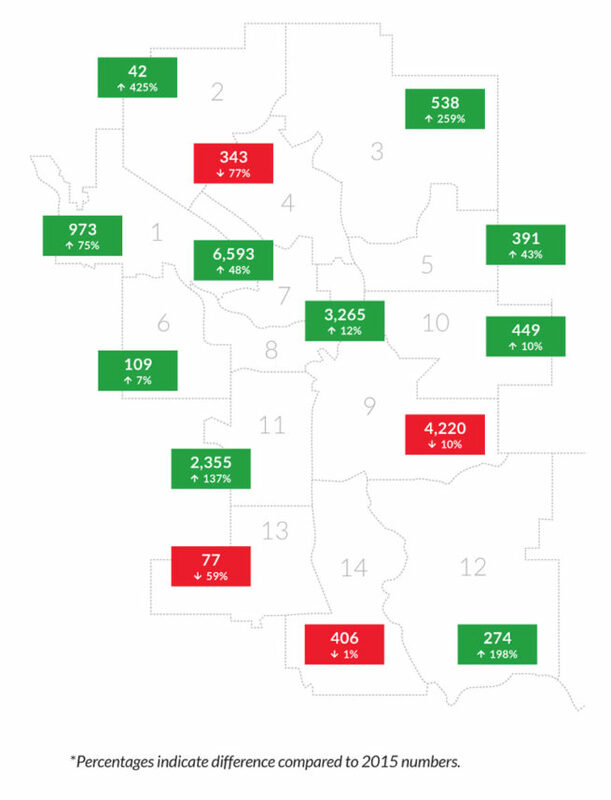 By year-end there were over 350 different venues featured on SpaceFinder Alberta, most of them in Calgary. Calgary Arts Development partnered with the Alberta Real Estate Foundation, ArtsBuild Ontario and Fractured Atlas (New York) to bring SpaceFinder Alberta to Calgary. SpaceFinder is a proven technology at work in municipalities across North America. Useful for all Calgarians, SpaceFinder Alberta includes detailed search criteria that pinpoint features needed by artists and arts organizations. Calgary Arts Development partnered with Edmonton Arts Habitat in 2016 to launch the online platform in that city. Late in 2016, Alberta Foundation for the Arts provided funding to broaden SpaceFinder’s reach to more communities in our province including Red Deer and Medicine Hat. In 2016, a previous program, Arts Spaces Networking Nights, was combined with SpaceFinder Alberta sessions , providing on-the-spot support for venues to create listings. In addition to being a match-making service for renters and venues, SpaceFinder is also a database with built-in metrics reports (including rental rates, usage rates, user and venue data) that can be used by venues, analysts and policymakers. Reclaiming Calgary’s Cultural Identity: Arts Spaces Strategy and Capital Plan was published in 2007. In 2016, Calgary Arts Development initiated a process to refresh the 2007 report’s data and recommendations. The new 2017 report will examine achievements over the past decade and include recommendations that reflect the current space needs and preferences of Calgarians to live creative lives, positioning Calgary to take advantage of future funding opportunities. The Cultural Space Investment Process (CSIP) was a capital project evaluation process established by Calgary Arts Development to inform City Council and the municipality of priorities for community-led cultural infrastructure projects. The City requested that there be no new intake of projects to CSIP in 201 6 while previously recommended projects were reviewed. The Calgary Chamber, in partnership with Calgary Arts Development, launched a new initiative called Artists in the Workplace. This program was kick-started by Calgary Poet Laureate derek beaulieu to connect businesses who have extra space with artists seeking space to work. The program allows businesses to identify themselves as having space available, and Calgary Arts Development helps match them with an artist or organization to animate their space. In 2016, businesses made eight different spaces available for the program and Calgary Arts Development worked with 20 artists and arts organizations seeking a match. In 2017, Artists in the Workplace spaces will be migrated over to the SpaceFinder Alberta platform. cSPACE was created in 2011 as a subsidiary of Calgary Arts Development in partnership with the Calgary Foundation to strategically address a critical demand for creation, production, presentation and rehearsal spaces that are affordable, sustainable and collaborative. cSPACE is nearing completion of its flagship project, the award-winning transformation of a vacant sandstone school and three acre site in Marda Loop into a mixed use, innovation hub for the cultural and creative sector. 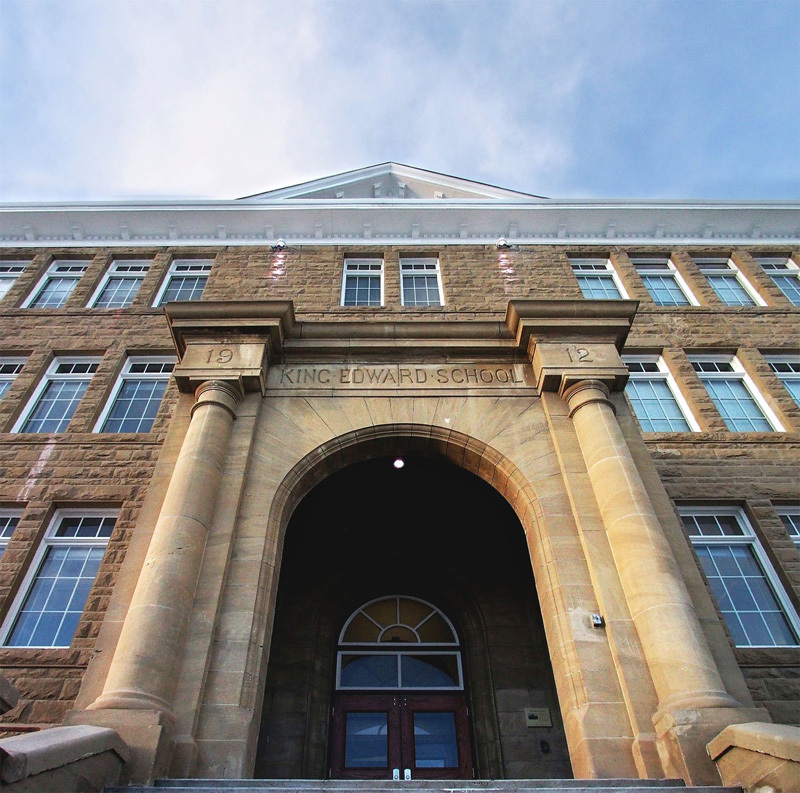 At the heart of the development is the repurposing of a municipally designated heritage school into a 47,500 s.f. 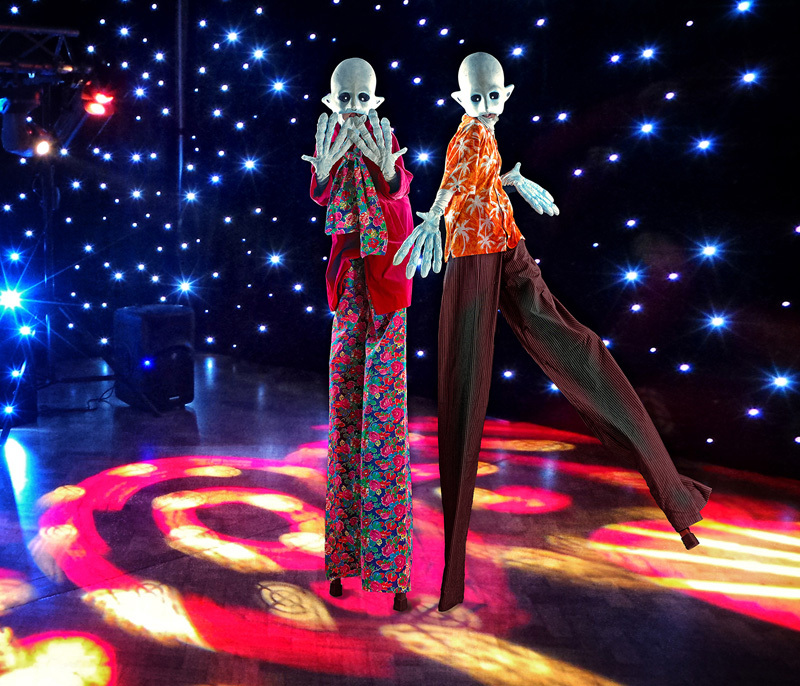 multi-disciplinary arts, culture and community facility. Opened to tenants at the end of 2016, cSPACE King Edward is 100% leased with 32 longterm tenants including mixed-discipline artists and designermakers, cultural non-profits and a cafe. Major exhibitions have booked into 2017 including Exposure Photography Festival, People’s Portrait Prize and Off Limits’ I am Western installation that showcases the work of 14 contemporary artists including Chris Cran, Terrance Houle and Mitch Kern. Three innovative public art projects were awarded by cSPACE’s community juries in 2016 to exciting Calgary-based artist teams. Katie Green and daniel j kirk are installing Imaginarium throughout multiple floors of the new glassed-in stairwell in 2017. Caitlind Brown, Wayne Garrett and Lane Shordee are tackling two projects, one at the ceremonial south entrance to the sandstone school (2017) and the other as a gateway to the new municipal park (2018). cSPACE has also partnered with one of their developer partners on site to embed Kris Demeanor’s original poem on the King Edward in the wall facing the hub. The construction of the contemporary wing attached to the historic school will also be completed in the fall of 2017. The addition comprises a new 125-seat studio theatre, flexible event and meeting spaces, a new arts-infused park, ACAD’s Continuing Education teaching studio and a co-working hub for creatives and social entrepreneurs. 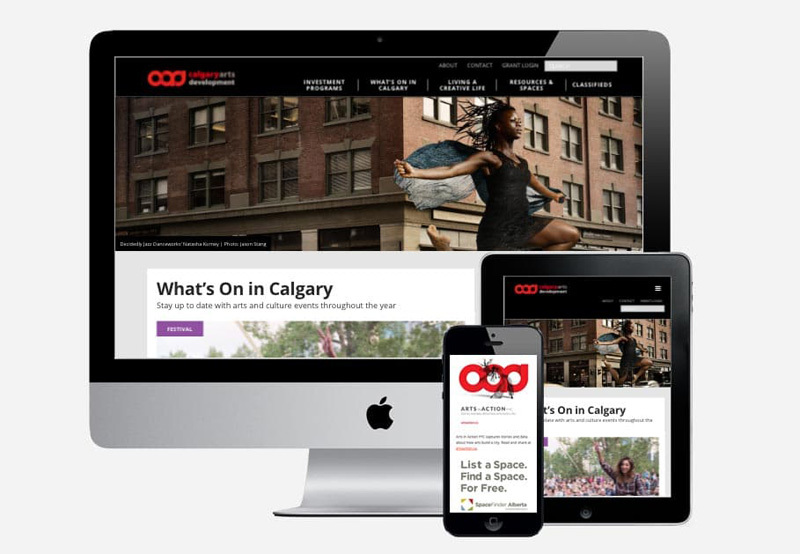 In 2016, Calgary Arts Development launched a new website, which brought previously separate websites (Calgary Arts Development, Living a Creative Life, Mayor’s Lunch for Arts Champions, Calgary Culture) under one umbrella. The new site is much more content-rich with a greater focus on storytelling. Part of the new website, What’s On In Calgary offers a comprehensive listing of events, exhibitions, festivals and performances in Calgary. In addition to being posted on our website, these listings are also promoted through a weekly newsletter and through social media. An idea that came out of the Creative Calgary Congress 2015, The Storytelling Project features a weekly story about someone in Calgary who is living a creative life. Writer Stephen Hunt conducts interviews and creates stories about these creative Calgarians. The Calgary Arts Development website hosts a robust and popular classifieds section. This free service is an online venue for sharing announcements relevant to the arts sector such as job listings, volunteer opportunities, audition notices, calls for submissions, educational opportunities, industry events, items for sale or wanted, requests for proposals and notices of spaces available or wanted. 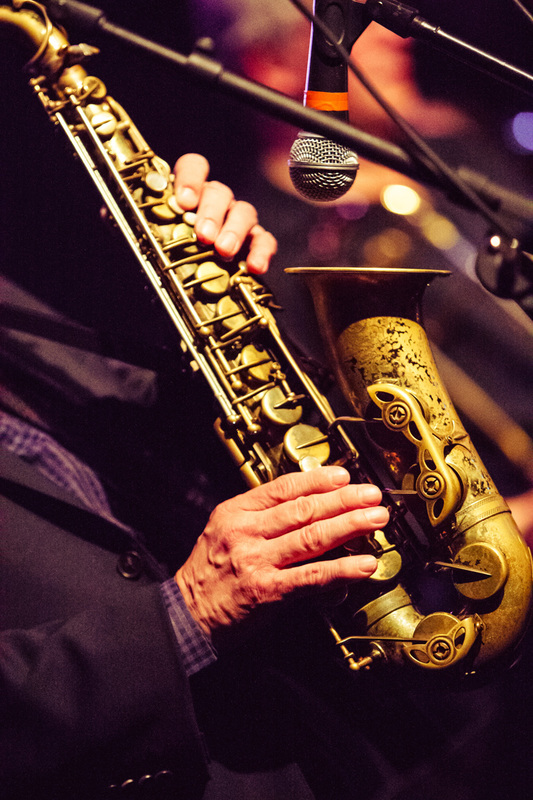 Calgary Arts Development continues to build partnerships with other organizations in order to ensure that arts and artists are included and supported in as many corners of the community as possible. Here are a few examples of specific connections that took place in 2016. Led by Cowboy Smithx and the Iiniistsi Treaty Arts Society, the inaugural Artsdance took place at Mount Royal University on June 23, 2016. Artists and arts organizations came together with Elders and Indigenous performers to share their work and stories through the lens of Indigenous ways of knowing and ceremony. Two tipis were set up on site with performances and various discussions taking place throughout the day. Calgary Arts Development was please to support and participate in Artsdance. The 2016 Art for Social Change annual meeting took place in Calgary in October 2016, during which Calgary Arts Development hosted a Community Dialogue. The aim of the gathering was to share some of the findings of the five-year Arts for Social Change National Research Project (ASC) and to provide an opportunity for Calgary artists and arts organizations to talk about the role of art for social change initiatives in our city. Dancing Parkinson’s YYC, led by Anne Flynn and DJD, is part of this project and is what warranted our initial support. For more information about the ASC project, go to icasc.ca. Calgary Arts Development continues to participate on the Calgary Board of Education Fine Arts Advisory Council and, in 2016, Calgary Arts Development Director of Community Investment and Impact, Emiko Muraki, joined the Research Sub-committee. We were pleased to learn that the Ministry of Education is changing the K-12 curriculum to include Arts and Wellness as two of the six core subjects required. This reinstatement of Arts into the core curriculum will be a sea change after 30 years as an option. Calgary Arts Development CEO and Board Chair conducted one-on-one meetings with City Councillors to share with them how much arts activity is provided by organizations that receive funding from Calgary Arts Development in each of their wards. Calgary Arts Development attended a number of meetings with Provincial Government officials including a meeting with the new Provincial Minister of Culture, Hon. Ricardo Miranda; the pre-budget round table hosted by Premier Rachel Notley and Hon. Joe Ceci, Minister of Finance; and the presentation of the Alberta Budget 2016 stakeholder meeting hosted by Minister Miranda. Tri Level Funding meetings with Canada Council for the Arts, Canadian Heritage, Alberta Foundation for the Arts, Edmonton Arts Council, Calgary Arts Development and Calgary Foundation continued through 2016. These are valuable information sharing meetings, which keep funders informed of national trends and activities. Partnerships with other civic partners and city-building organizations such as Calgary Economic Development, Tourism Calgary, Sport Calgary, the Calgary Chamber, Downtown Calgary, Calgary Foundation, and many more, continued through 2016. Calgary Arts Development continues to work closely with The City of Calgary Department of Arts and Culture, as well as with the Office of the Mayor. Patti Pon was an active participant on the Cultural Plan Steering Committee. The Cultural Plan, which can be found at calgary.ca, was adopted by City Council on November 28, 2016. There is a need for Calgarians and visitors to be better aware of the events, festivals, performances and experiences available to them. A strategy is needed to attract, develop, enhance, promote and strengthen premier cultural experiences year-round. That there is a deficit of hosting infrastructure including revitalized performing arts infrastructure, more accessible space and a defined cultural district to ensure that Calgary’s cultural scene will continue to flourish. To learn more visit visitcalgary.com. Patti Pon participated on the JUNOs Host Committee. One of their objectives was to ensure community engagement beyond the Awards themselves. 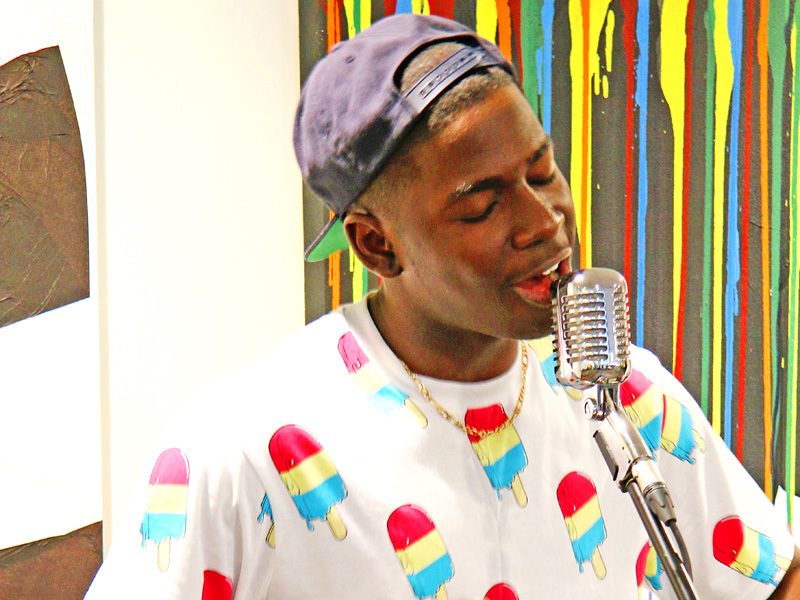 There were more than 60 events and programs during JUNO Week, leading up to the Awards. Of particular impact was the JUNOs micro grant program through which $25,000 was invested in 18 local projects, in grants of $500-$2,500, that afforded thousands of Calgarians to feel like they were a part of the JUNOs even though they may not have gone to the actual Awards. Calgary hosted one of the most successful JUNOs ever, with more than $9 million in economic activity in one week; 32,000 JUNO event attendees; 225 participating artists; 1,450 local volunteers; and millions of social media impressions and broadcast viewers who heard new stories about Calgary. We continue to work closely with other Civic Partners such as Calgary Economic Development (CED). Calgary Arts Development is a lead stakeholder on the CED Economic Development Strategy and CED is a signatory to the arts strategy Living a Creative Life. CED’s Court Ellingson participated as an Activator at the 2016 Creative Calgary Congress, co-leading a session that explored the theme of shared prosperity. To learn more visit calgaryeconomicdevelopment.com. Calgary Arts Development participated in Calgary Stampede Arts Conversation and Community Engagement activities. Calgary Arts Development Spaces Consultant, Joni Carroll, participated in conversations about the planning of theatre and visual arts spaces in the Rocky Ridge and Seton Recreation Centres. Calgary Arts Development also advised on arts spaces in the TELUS Sky project and the Calgary Board of Education’s proposed theatre at Nelson Mandela High School adjacent to the Genesis Centre. Calgary Arts Development was given funds by the Alberta Foundation for the Arts to animate distribution centres for Fort McMurray evacuees who were relocated to Calgary after the devastating fires in their city. With those funds, we hired artists to perform for the people who had to stand in long lines as they awaited assistance. Calgary Arts Development received national exposure when President & CEO Patti Pon spoke at The Walrus Talks What is Art Anyway in June 2016. Calgary’s first arts equity summit was held on May 16, 2016. Following that, a survey was undertaken to investigate the state of EDI in the arts in Calgary. Calgary Congress for Equity and Diversity in the Arts (CCEDA) presented at the Professional Association of Canadian Theatres (PACT) annual conference, which was held in Calgary. CCEDA is being recognized nationally as a leader in the area of EDI and we, at Calgary Arts Development, have been working with CCEDA and others to develop our own EDI training and capacity. On October 27, 2016 Calgary Arts Development announced a unique partnership with CCEDA called In/Pact. The specific goals of In/Pact are to stimulate city-wide discussion about the value of EDI in the arts and to strengthen the arts sector’s EDI capacity. Over the next year, CCEDA and Calgary Arts Development are embarking on a series of shared activities, including community consultations and conversations; and the development of a suite of reporting, measurement and assessment tools to assist Calgary’s arts sector with their own EDI strategies. Other EDI activities in 2016 included participation in Diversity Training with the Asian Heritage Foundation (Southern Alberta), Diversity Training with the Ethnocultural Council of Calgary, and participation in A Call to Arms: A Consultation on the Future of Policy Advocacy by Charities in Canada at the Calgary Arts Equity Summit. Calgary Arts Development is governed by a Board of Directors, appointed by and directly accountable to its Shareholder, The City of Calgary, via City Council. The Board of Directors governs lawfully, observing the principles of the policy governance model, with an emphasis on strategic leadership and clear distinction of Board and CEO roles. The Board also identifies the principal risks of Calgary Arts Development’s business, achieves a proper balance between risks incurred and potential returns, and oversees the development of policies and the implementation of appropriate systems to manage the risks. In 2016, there were five regular board meetings and a two-day retreat scheduled, with an attendance record of 82%. Providing guidance and evaluation to the board of directors for the development and evaluation of Calgary Arts Development’s alignment with our mission and vision, and facilitates strategic planning process in coordination with the board. Members of the Board are conscious of the conflicts of interest that may arise in the normal course of business or as a result of a Board member being connected to an organization that may receive direct or indirect benefits from the activities of Calgary Arts Development. Each Board member shall disclose in writing all known real and potential conflicts upon appointment to the Board and on an annual basis and otherwise in accordance with this policy. Program guidelines specifying objectives, decision-making processes and assessment criteria are designed for each arts investment program (including granting programs and recommendations to City Council on infrastructure investments). Along with program guidelines, Terms of Reference provide direction to arm’s-length volunteer assessors who make recommendations to Calgary Arts Development. In 2016 staff communicated these recommendations to the Board of Directors, who reviewed and approved the grant process. Calgary Arts Development is The City of Calgary’s arm’s-length arts development authority.